Abingdon Blog » Every Little Hurts? There was also a protest outside the old Ox Pub at 2pm. Tesco already has a fairly dominant share of the Abingdon retail market. The Ox would become the third Tesco outlet. Somehow I don’t think Abingdon’s going to become a hotbed of revolution against The Empire’s plans to take over the universe, though. Give it a few weeks and they’ll all be shopping there anyway, they can’t resist the reduced sandwiches and cute little pots of strawberries and cream. Well tesco express is expensive for cigs and alcohol and grocery do some research. there dont be no bogofs like the supermarket. so its all an illusion and people are getting to know this up and down the country. Save – as Mao says (not my normal political inspiration) every journey starts with a single step. Well done all those concerned Abingdonians who turned out this afternoon. anyone who has a pension fund is already a tesco owner – cutting off your nose to spite your face. looks like a dog – pugs are a rather inbred breed that suffer from many problems with breathing so maybe a pushchair ride was needed. for example, is interesting for those considering planning issues. There is, of course, a Tesco argument and I think we’d all be astonished if it wasn’t a self-interested argument perhaps being expressed by commentators who’ve only very recently made an appearance on this blog. However, it would be dangerous to underestimate Tesco as it didn’t get as big as it is by being stupid and it has huge experience in making mince-meat of local opposition as the locals have hardly, if any, experience of dealing with a determined behemoth like Tesco. Tesco’s Ox project is part of a defensive strategy it has to make it less attractive for a competitor to move into a redeveloped Bury Street/Charter. What the Bury Street development needs is a Lidl, or an Aldi, which would act as a driver for Town Centre traffic. The town also needs a Weatherspoons, but that’s another story. 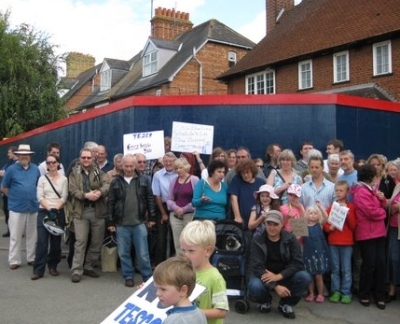 There’s a lot to learn from the Tescopoly site and our councillors, who’ve shown their spurs by passing the parking scheme, could be even more impressive and useful to the Town’s vitality by standing firm against Tesco. I think the key thing is people should not shop there, there is no REAL need for a store there. doubtless people will still shop there but IF they didnt they would be forced to close. How long is it till the pub on the bridge is a tesco? in fairness, if i lived next door to a pub i probably wouldn’t want it to have a late license either. Or, shall we say, thirty shillings of silver? The Nags Head my hope is that Salters will take it over, tho I don’t know, maybe Tesco would be the only company able to afford the rent??!!. Rumours are it could be changed into appartments/housing. (planning required?). can’t see the nags being a shop – who would the customers be? – it’s too far from homes. Thanks Agnes – beat me to it! shh…don’t tell Tescos, but Audrey’s flower shop has planning permission for residential use…. I actually quite like Tesco. They provide jobs, are British, keep the economy going and have enough money to pay the rent and maintain the land. Perhaps Angela Lawrence and the other protesters would like to come up with a significant alternative? Oh no wait, you can’t. He has got a point though hasnt he? They will keep the place looking tidy and they wont move out in a few months because they cant afford the rent. The car parts shop should do nicely as his customers will have somewhere to park now. Im sure with all these tesco stores around town they will find it hard to refuse to give something back to the town maybe they will sponser the xmas lights or some flower beds or give something to local charities. Did the last shop keeper at best one do any of that in his 15 or more years of being there? Also how many local people are employed at Best One? How much local or british or fair trade produce is sold in Best One? Anyway 400 protesters (many of which were kiddies) say they wont shop there but im sure a few of the 30 odd thousand other Abingdon residents who arent against it will do. Actually i’m not a PR company from Tesco, It’d be interesting to know how you supposedly came up with that? I live in Abingdon. Hilarious. Tesco owners may live in Israel but it is a BRITISH company. It was founded in East London in 1919. Look it up on Wikipedia. And yes I agree with ‘Native’ completely. no tesco is the answer so many businesses have closed down in the country its retail power gone too far. tesco will pay for one council tax in business rates and put about 4 or more shops out of business and then you get boarded up shops with no tenants no rent no rates look at stoke up on trent which has tescos all over the city with most of the previous shops closed down. it looks a mess. i have been there some people on this blog need to go out a bit more around england to see the long term affect. then we wil see who supports tesco. Micky, Abingdon already looks a mess. I don’t think anything could make it worse. Most people have been all over England.